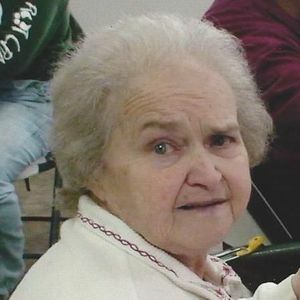 CENTRAL CITY - Mary Sue Fulkerson, 82, of Central City, died Thursday, March 3, 2016, at 5:45AM at Ohio County Hospital. Mrs. Fulkerson was born September 11, 1933, in Grayson County. She was a homemaker and member of Nelson Creek Missionary Baptist Church. She was preceded in death by her parents, Clarence and Margaret O'Brien; brothers Thomas, Billy, Wendell, Dale, and Donald O'Brien; daughter Reginia Fulkerson; and son Thomas Eugene Fulkerson. She is survived by her husband, Darrell Fulkerson; sons Eddie Fulkerson of Central City and Wayne (Tammy) Fulkerson of Powderly; daughters Julia (Jerry) Creasy of Nelson Creek and Tammy (Bobby) Vincent of Central City; six grandchildren; three great-grandchildren; brothers Harold O'Brien of Rockport, Larry Neil O'Brien of Nelson Creek, and Johnny O'Brien of Hartford; and sisters Jane Rhule of Texas, Aileen Maugherman of Florida, and Doris Salmon of Louisville. Funeral services will be Sunday, March 6, 2016, at 2:00PM at Tucker Funeral Home in Central City, with Rev. Curtis McGehee officiating, assisted by Rev. Donnie Wilkins. Burial in Rose Hill Cemetery. Visitation will be Saturday after 5:00PM at the funeral home. Online condolences may be made at www.tuckerfuneralhomes.com. I didn't know Mary Sue until her final year or so but I always thought she was such a "well loved" lady. Her family was always present every day and she took comfort in knowing they were there. I told her once "you must have done something right to have so many people care about you and come to visit", she replied " The Lord has blessed me" and I knew she meant it. Prayers to her family-she knew you all cared. We are so sorry to hear of your Mother's passing Wayne. SO SORRY FOR YOUR LOSS WAYNE AND FAMILY! Sue was such a sweet lady. She will truly be missed. Praying that God gives you peace and comfort. She will be missed, a truly nice and considerate lady. I several fond memories of Sue while growing up. It seems like yesterday she and my mom were sitting on the front porch at dusk talking. Maybe the two can sit on a front porch in Heaven and reminisce about old times! May god bless Sue and her family.